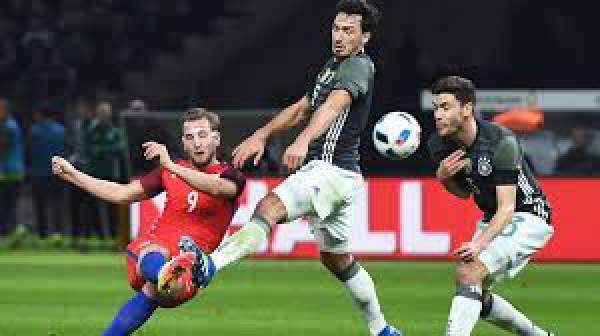 Germany vs England Live Streaming International Friendly Football Score ENG v GER: It is time for the International break as players heads to their respective national teams to represent their nations. The International break is a relief for the managers as they get time to analyze and make new strategies as the season is heading towards its business end. Today we have Germany hosting England at Signal Iduna Park, home of Borussia Dortmund. 23rd March 2017 at 01:15 (IST). Raheem Sterling is doubt to play today as he is injured and missed training. Manchester United centre-back Phil Jones is out injured, but Chris Smalling is available. Chelsea defender Gary Cahill will captain the England under their new manager Gareth Southgate. Strikers Harry Kane and Daniel Sturridge are out injured, Defoe, Vardy, and Rushford will be available for the fixture. England has lost only one of their last 16 away International games, winning nine and drawing six. The last time these teams met, Germany was 2-0 up, and England came from behind to win the game by 3-2, Vardy and Dier scored their first International goals. England played against Spain in their last International Friendly and was able to draw the game by 2-2. Adam Lallana and Vardy scored for England, in the ninth and 48th minute respectively. Spain was able to get back in the match as Iago Aspas and Isco scored late in the match to make it 2-2. Germany has been one of the most difficult team to play against especially because of the depth in their squad. Mesut Ozil, Julian Draxler, Mario Gomez and Manuel Neuer will be missing the game through injury. They haven’t lost back to back International friendlies since 1956. In their last friendly Germany blew off a 2 goal lead which came from their only two shots on target in the game. Germany has lost just one of 18 games they have played in Dortmund, losing to Italy in the 2006 World Cup, winning 15 and drawing two. They have gone 558 minutes without conceding an International goal. They played against Italy in their last friendly and was able to get a draw out of it. Stay tuned to TheReporterTimes.com for latest football news and updates. Don’t forget to share on the social sites.